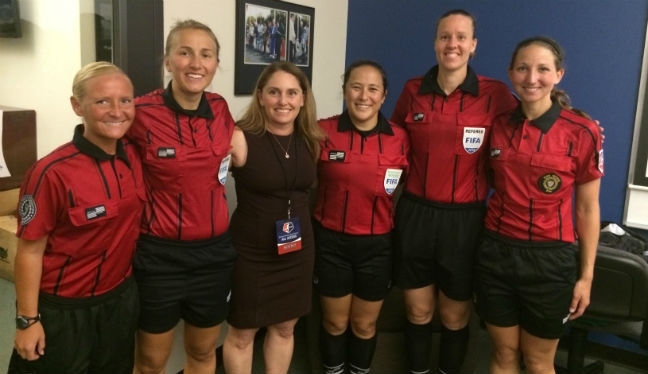 Sandra Serafini has been named as the Professional Referee Organization’s new Women’s Referee Manager. The former FIFA official was previously operating on PRO’s support staff on a part-time basis as a Women’s Referee coach and Assignor, but she has now joined the Organization in a full-time role. Prior to the inception of PRO, Serafini was an assignor for WPS under U.S. Soccer and up to now she has combined her commitments in officiating with a position in the Neurosurgery Faculty at Duke University. “It’s very exciting and an honor to join PRO on a full-time basis to help the officials achieve the high standards that have been set by PRO’s General Manager Peter Walton,” she told proreferees.com. “The staff work very hard every day and in many different ways to implement those standards and it’s a privilege to be part of that team working full-time towards that goal. “I’ve spent the better part of the last 20 years as a neuroscientist and working in clinical research with adult and paediatric surgical epilepsy patients. I’ll definitely miss working with the patients and our clinical team, but I’m proud of what we’ve accomplished together in advancing standards of care for these patients. “The new role with PRO has been an evolving process over several years, starting with assigning for WPS in 2011 under U.S. Soccer and then transferring to PRO in 2013 to assign officials for the newly-formed NWSL on a part-time basis. “The league gave us very positive feedback on how things were organized but were looking for enhancements in on-field performance that required additional time and resources. “Once the discrepancies were laid out between what a part-time position could accomplish and what was required to make these advances, it became clear to the NWSL, U.S. Soccer, and PRO that a full-time position was required.